For 15 years, the debate has raged about the ‘War for Talent’ and yet, even after so long and despite the proliferation of talent processes, talent practitioners still accept that they haven’t cracked the ‘talent nut’. In a report by Deloitte1, only 10% of companies felt their talent programmes were performing at an ‘excellent’ level. The business case for strategically tackling talent is still a compelling one – organisations with a talent strategy are 4.2 times more likely to be in the top quartile of business outcomes2. Despite this, fewer than half of UK companies (44%) actually have a talent management strategy in place3. With the mass of information out there about best practice approaches, one would be forgiven for being confused about where to focus effort and resource. We reviewed a range of strategic talent management reports and in this article identify the pertinent issues to show what would add value to talent programmes. We asked Alison Rose, a seasoned practitioner of 15 years in the talent space, to identify the key areas of focus. The quality of leadership and lack of a healthy leadership pipeline is consistently cited as the key challenge for UK companies (86%)1, made even more critical by a lack of preparation for the departure of senior leaders – 59% say they are not or are only a little prepared3. So, with so many believing they are not making progress in this area, what are the reasons? Focus is almost exclusively at the top – resource is narrowly targeted on senior executives rather than taking a broader developmental approach across all levels in the organisation. Talent is not identified and developed further down the pipeline – 62% do not include first level and mid-managers in succession plans4 and typically less than one-in-five skilled professionals are included in succession planning4. Talent development is not seen to be a priority – leaders are not being incentivised to develop their successors and build talent across the organisation. Widening the net beyond ‘High Potentials’ – investment is heavily focused on ‘high potentials’ but the lack of confidence in accurate identification of potential indicates a better balance could be struck by more inclusive approaches which also direct resource towards specialists and the wider employee population. Inability to develop Millennial leaders – only 6% think they have excellent development programmes to develop Millennial leaders5 – but as the largest element of the workforce, Millennials are being promoted ever faster, requiring greater development focus. Confusing performance with potential – executives confuse good performance with potential, over-relying on ‘skills and competencies’5 rather than behaviours and traits as the main drivers for promotions. Subjective assessment of potential – factors such as learning agility, drive, self-awareness and analytical and reasoning skills are shown to be positive indicators of leadership potential. 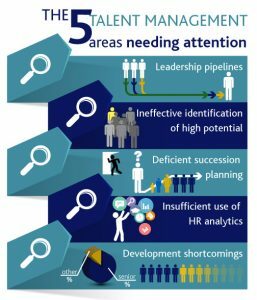 Good, objective assessment can accurately pinpoint individuals showing potential in these areas but talent management processes are still not robust enough to drive out subjectivity. There is insufficient effective planning for succession – only 28% of UK companies have formal succession planning in place for senior managers3, whilst companies recognise that career paths for specialists are limited. Changing business needs and the varying personal ambitions of potential talent demand the development of wider talent pools than are traditionally drawn upon for succession planning. Introducing succession planning earlier in careers and taking account of development need and personal ambition will give a more realistic approach to matching individuals to role requirements as these change. HR’s role is changing from a service provider to an enabler and builder of talent to meet business objectives. 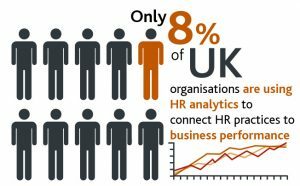 The use of technology and HR data integrated with wider organisation management information is, however, lagging far behind the speed of these changing requirements. Development is too generic and not sufficiently targeted at individual and specific business needs. Organisations are not investing in development at earlier career stages, meaning leadership talent pipelines are impeded. Millennial employees want development which is at their fingertips and provided in faster and user-friendly ways but companies are not yet embracing these new delivery channels and methods1. This picture is changing as companies recognise the challenge to ‘grow their own’ – 43% expect to increase development expenditure, whilst over one-in-five plan to reduce spend on recruitment3.